We, who had the privilege to live in Rhodesia, used to call it God’s Country; and looking back that still seems to sum it up pretty well. It was a well run civilized country – Darkest Africa in Fairest Mood! The country was wrested from barbarism by hardy pioneers and for 90 years there was progress and sound governance. So sound that within just a few generations the whites, who first arrived in 1890, had enabled the blacks they found there to grow in population from just a few hundred thousand to many millions! In that time Rhodesians had not only created a modern state, similar to those of say Australia or New Zealand, but had also lifted large numbers of the black Africans up with them. Today’s readers may need to be reminded that what became Rhodesia was an almost trackless wilderness where the relatively few inhabitants lived a wretched and primitive existence. They had not even advanced to the stage of having discovered the wheel. The most recent conquerors, the Matabele (an offshoot of the Zulus) had arrived just a few decades earlier and rapidly created a state of fear and tyranny over the more numerous but pastoral Shonas – who in their turn had ousted the original San / Bushman dwellers some centuries earlier. Never the less when the pioneers started to arrive in the 1890s there were only a few hundred thousand people living in an area three times the size of England! Think about that … there are over 50 million people in England; Rhodesia was all but empty! Rhodesia was never directly ruled by Britain; after 33 years under the administration of the British South Africa Company she was granted full internal self government in 1923. The less advanced African population was protected from the loss of their land to the more advanced whites by the special reservation of 25% of the country for traditional African use and in these areas whites could not buy land. After self government, the amount of land allocated for exclusive African use was progressively increased until by 1970 it had reached 50%. Of course large numbers also lived on European owned farms. Unlike the situation in North America, where the native population was almost exterminated by the white settlers, these extensive reserves were available to a growing and increasingly prosperous African population. Meantime the virgin bush was cleared, dams were built all over the country and hopeless looking parched bush land was irrigated and made available to both white and African farmers. Rhodesia set about becoming the breadbasket of Africa and regularly exported food to less well managed African countries. For those who spouted, or believed, the mantra that the whites took all the best land and left the African with the poor land please make a point of looking at the pictures on the “Golden Dawn” page. Here you can see many examples of hopeless looking parched bush land directly alongside lush and prosperous crops. The common trick of those wishing to denigrate Rhodesia was to show pictures or film of subsistence farming in the bush which the supposedly nasty whites had “left for the African” and compare that with separate views of the “best land” from which the whites were obtaining bumper harvests. The ignorant and gullible naturally believed what they saw with their own eyes. But the land was the same – only the method of farming was different. Now you can look and see the same in proper context! But it is all too late, as the world destroyed Rhodesia and all the hope has gone. The productive white owned farms have been ruined and subsistence agriculture now exists where once there were bountiful crops. Zimbabwe holds out the begging bowl and the same ignorant and gullible people are now asked to fill it! 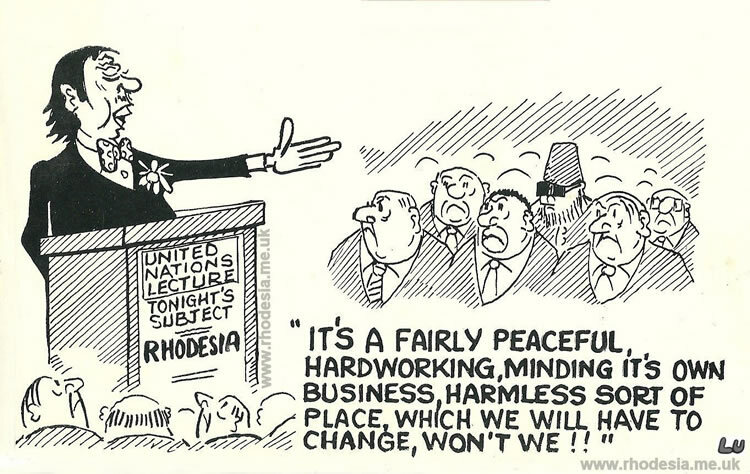 A cartoon by E Lucock exemplifying the sick state of modern world morality as applied to Rhodesia. 75 proud years of progressive development and more than 40 years of exemplary self government during which time Rhodesian Prime Ministers were invited, along with other Dominion leaders, to Imperial and later Commonwealth conferences; these were a sound preparation for nationhood. Rhodesia felt that she now deserved the full independence which was being foisted prematurely on so many inexperienced African states. BUT that independence should not be on a basis that would almost certainly destroy all that had been built up – as was already becoming clear elsewhere in Africa. It should rather be on the basis of continued steady progression based on civilized standards. When that simple request was denied, her democratically elected government, following a well known precedent in North America, declared Rhodesia independent on 11th November 1965. Since the “enlightenment” of the late twentieth century, war and genocide and famine have been common in the new Africa yet Rhodesia managed to resist the tide of anarchy sweeping sub-Saharan Africa. Rhodesia remained a shining beacon of prosperity and sound administration in an otherwise dark continent: Unemployment at only around 5% ; Health services, including the largest and best equipped African hospital in the whole of Central Africa, compared favourably with Britain and North America; The crime rate ranked amongst the lowest in the world; An education system which was the envy of nearly every state to the North, along with modern highways and a magnificent network of railroads and efficient telephone system, all these helped stimulate the economy despite vindictive UN sanctions. Like the traditional English bobbies, Rhodesian police usually patrolled unarmed. Indeed for the first sixty years of the twentieth century the BSAP, as they were known, held a proud record of not having taken a single life in the maintenance of law and order. How many police forces in the world could match that? However the modern world approach to caring for the African involves less real and genuine care than that which Rhodesia’s, maybe paternalistic, meritocratic approach offered. So the world’s care has left most of the Africans in a far worse state than would have obtained had Rhodesia’s advancement on merit method been allowed to continue to fruition. Most of the world turned on Rhodesia in a self-gratifying moral outrage and in varying ways sought its downfall. Communist Russia and China sent weapons and trained terrorists. Britain and the USA and overseas churches(!) among many others gave money and moral support to enable terrorists to commit outrageous crimes against African humanity. Despite this Rhodesia actually prospered until in 1975, after a left wing coup in Portugal the previous year, Rhodesia’s long border with Moçambique became directly exposed to terrorist incursions and after a valiant struggle in which the terrorists were aided and abetted by the communist states and those in the West who should have behaved better, to put it mildly, Rhodesia was forced to succumb. By 1979 after 15 years of world sanctions, and despite its armed forces remaining very much undefeated, Rhodesia had to throw in the towel. This was unavoidable after South Africa’s Prime Minister Vorster threatened to cut off vital supplies of fuel and munitions in an incredibly naive belief that South Africa might survive by throwing Rhodesia to the wolves led by Dr Kissinger. Britain then supervised an election in which, typically, it turned a blind eye to massive intimidation from Mugabe’s terrorist butchers enabling him to assume power. The world had won and Rhodesia had lost. One imagines that the same starry eyed liberal establishments who were so keen to bring down this jewel of Africa are happy with what they achieved. Robert Mugabe and his henchmen were no doubt also happy. Had sanity prevailed in the world, Rhodesia today would be exporting vast quantities of food across Africa instead of holding out the begging bowl. Ah well, that’s what the self-righteous in Britain and America wanted …. wasn’t it?! This site was started in 2011, and much has been added in the years since, but there is much more to come so revisit when you have time! Various articles, pictures, maps, recordings and ephemera dating back to the 1890s (the large majority of which are from my own archive) seek to portray the Real Rhodesia; the Jewel of Africa. Those who have first hand experience and personal memories of Rhodesia are now generally aged over 50 and within a few decades, sorry to say, we will all be gone! I have arranged for my children to keep this site on line for at least a few decades after that so there will be an accessible record for the next generation. The country called Rhodesia existed for 90 years and much was achieved during this time – and not just in the last few years. To future generations the 1960s and 70s will be just as much history as the 1890s or 1930s. For this reason this site seeks to present aspects of Rhodesia from the whole of her life.